Pictured from left are scholarship winners Braden Kamora, Adam Sickels, Ezra Blain, and Julianna Yates. Pictured from left are scholarship winners Kaden Thomas, Grace Martin, and Caleb Greenlee. 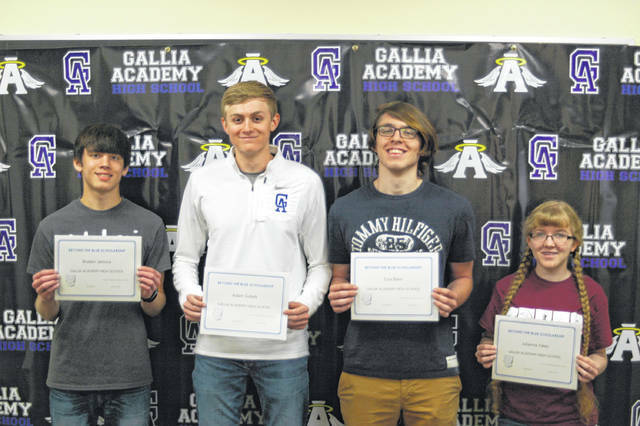 CENTENARY — Nine seniors at Gallia Academy High School have been awarded with scholarships. One senior, Adam Sickels, received the Maude Sellards Scholarship which goes to the top academic student in each high school in Gallia and Meigs Counties. Consideration for the scholarship, which provides $1,000 to graduating seniors, is based entirely on academic performance. “It’s a great honor. I never thought I’d get all this stuff that I’ve gotten so far. I want to say thank you and I hope I wont let you down,” said Sickels. Sickels was also one of four recipients of the Beyond the Blue Scholarship, which takes into consideration four main areas. Character, maturity, and motivation, well-rounded background including life beyond the classroom, leadership potential, and academic performance. Sickels, along with Ezra Blain, Julianna Yates, and Braden Jamora will each receive $4,000 over four years. All four students are pursing degrees in areas of biomedical, chemical, and computer engineering. “I want to have the medical knowledge to be able to help people in trouble,” said Yates. “I’m hoping that i can make some new discoveries or develop new technologies,” said Jamora. “I want to be a software engineer at NASA,” said Sickels. Three other seniors were award scholarships based on their athletic performance in addition to their academic records. Two students earned the Brad Abels Academic and Athletic Scholarship, which considers grade point average and varsity letters. Each year the award is given to a male and female student. Grace Martin and Kaden Thomas both received this scholarship, earning $1,000 each for undergraduate studies. Martin plans to attend West Virginia State University and play volleyball, which she played throughout high school. Thomas, while being successful athletically in high school, is going to focus on academics while attending Marshall University. Caleb Greenlee is the sole recipient of the Jamie Mills Memorial Athletic Scholarship, which was established by his family in his memory. Mills was a 1979 graduate from GAHS and played football and wrestled. Greenlee has been active in sports his entire academic career both in wrestling and in distance running. Greenlee is tied for the most varsity letters at Gallia Academy, having earned the maximum of 12. “I’m going to run cross country and track at Ohio Christian University and I’m going to study agribusiness,” said Greenlee. Not only has Greenlee been an active athlete and student, he has also been an awarded member of the Gallipolis FFA club and on his family farm.